Smoke: Your hands are shown empty and from thin air produce a sharpie. Then you tell the spectator to use their imagination as you pretend to draw paper and tobacco in thin air. Once you do, you roll the imaginary cigarette, light it and produce smoke from thin air. 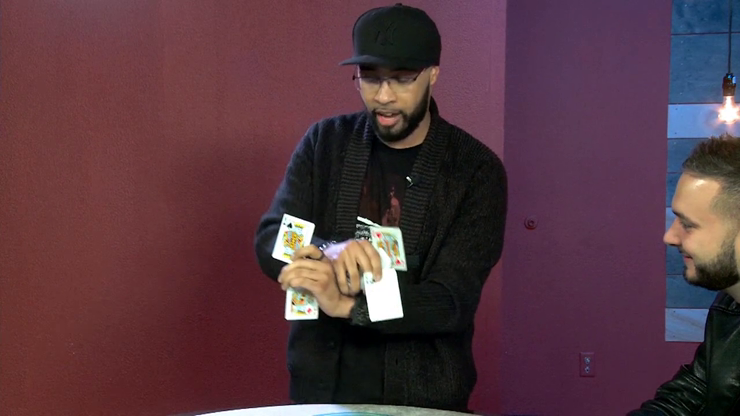 Eric Collectors Routine: Four Kings are shown as three cards are signed, selected and lost into the deck. The signed cards then appear between the Kings. Performing With Rhythm: Eric shares what it takes to perform smoothly and in rhythm, which is important for all performers. Hellbound Spellbound: Our favorite trick of the lecture. A hyper visual, multiple phase coin routine that should go straight into any coin magician's repertoire. Self-Working Coin Trick: A copper coin and a silver coin are shown and held, one in each hand, and visually change places multiple times. So good it looks like a camera trick. Eric's Creative Process: Eric shares what it takes to create your own effects. If you're a tinkerer of magic, this is your sandbox. Impromptu Coin and Hat: Borrow a spectator's hat and a coin. The coin in placed in the hand but appears inside the hat that has been on the spectator's head the whole time. Ishkabibble Sandwhich: One of David Blaine's favorite effects that Eric performs. A card visually appears between two kings. This is one you'll have to see to believe. Ungimmicked and devastating. Simply enter your details below and we will send you an e-mail when “At the Table Live Lecture Eric Jones - DVD” is available to ship!